Casino Royale in Concert - Film Concerts Live! Film Concerts Live! Film Concerts Live! proudly presents Casino Royale in Concert, the first installment in the brand new James Bond Concert Series, produced in association with EON Productions and Metro-Goldwyn-Mayer Studios (MGM). For the first time ever, audiences will be able to experience Bond on the big screen accompanied by the power of a full symphony orchestra performing composer David Arnold’s thrilling musical score live and in sync to the picture! 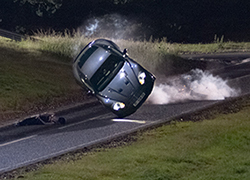 With Casino Royale, EON Productions and MGM launched their wildly successful reboot of the Bond franchise, and at the time of its release in 2006, it became the highest grossing film in series history. It also marked Daniel Craig’s first appearance as the legendary MI6 operative, and he earned high marks with fans and critics alike. Directed by Martin Campbell, Casino Royale brings us Bond at the start of his career, having just earned 00 status and his licence to kill, and pits him against the ruthless terrorist financier known as Le Chiffre (Mads Mikkelsen). 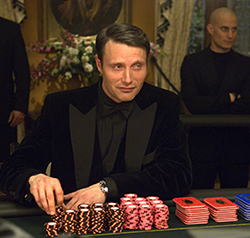 From the jungles of Madagascar to the white sand beaches of the Bahamas, Bond’s pursuit of Le Chiffre leads to a showdown in a high-stakes poker game at the luxurious Casino Royale in Montenegro, and ultimately to a jaw-dropping finale on the Grand Canal in Venice. 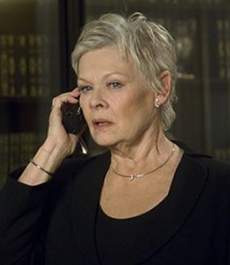 Bond’s mysterious MI6 contact in Montenegro, and Judi Dench returns as the stalwart and indomitable M.
CASINO ROYALE LICENSED BY METRO-GOLDWYN-MAYER STUDIOS INC. CASINO ROYALE © 2006 DANJAQ, LLC. AND UNITED ARTISTS CORPORATION. CASINO ROYALE, 007 GUN LOGO AND RELATED JAMES BOND TRADEMARKS ARE TRADEMARKS OF DANJAQ, LLC. ALL RIGHTS RESERVED.